"It is by riding a bicycle that you learn the contours of a country best." This web site was set up to journal what began as a childhood dream; to bicycle across America. College, careers, and kids came first, but we finally had an opportunity to realize this goal. 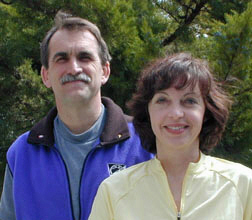 Our careers are established with what we hope is some degree of professionalism (Mike as a respiratory therapist, and Marilyn, a nurse practitioner), our kids are grown, (our grandkids are growing), ...and so on May 19, 2001, we left our home in eastern Washington state to spend the summer bicycling the TransAmerica Bicycle Trail. Bicycle touring is not always the easiest way to travel, but for us, it is the most rewarding. When we travel by bicycle, we invariably find adventure, gain new insight, make new friends, and eat as much as we want. This journal is dedicated to our favorite mode of travel and the accomplishment of our goal. You can’t take much stuff on a bike tour. Everything we needed had to fit on our two bikes (a Cannondale T2000and a Bruce Gordon BLT). Besides the usual bare-bones camping gear and minimalist wardrobe, we took several cameras, a weather radio, so we did not become a scene from Twister, and a very cute 2 lb. mini-laptop computer, a Toshiba Libretto 100CT. These teeny Librettos must have been designed for bicycle tourists who don't think they can leave home without a full function computer. (These are no longer available new in the U.S.). In order to save weight elsewhere (i.e. avoid cooking), we left the stove and cook set behind. Mike was also persuaded to leave the steam iron, chain saw, and BBQ grill at home. We would love getting email from you, hearing how you are, or answering any questions, so please drop us a line at biketrip2001@aol.com. We still check our individual AOL email addresses too if that is the address you have for us. This journal was recently reconstructed in a more current software compatible with today's webhosting. Many of the original photos were taken with a low resolution camera and some photos have been lost, so we apologize for photos that are less than sharp. Click on the button below to start the Journal (or you can skip it all and jump right to the end OR go to other journals).